Six weeks ago I started a ‘Knit Your Own Baby Blanket’ class at Fibre Space in Alexandria, VA. I’ve knit a blanket before but I wanted to learn how to construct them and create my own patterns to make unique gifts for my friends. Six weeks ago I started off making a white, pink and purple blanket for a baby girl (anyone want a half of a blanket, you could say it’s for naps…) and then found out that my new goddaughter-to-be was really going to be a godSON! 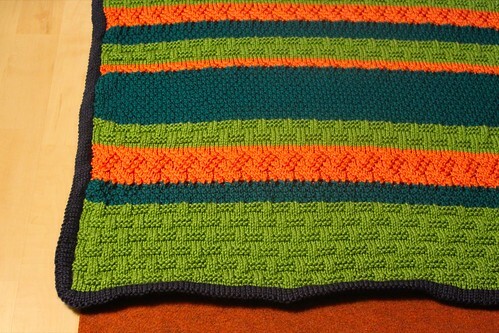 I ran back out to the store and picked a palette of apple green, orange, teal and navy blue for the border – something boy but still fun. Heck, I’d give this to a little girl perhaps without the navy border. I’d even knit one for my own house since it matches it so perfectly. 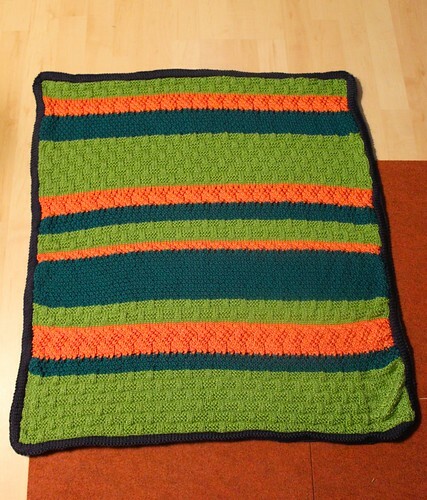 I knit the body of the blanket in a staggering 10 days so that I could be where I was supposed to be in class when I learned how to add a border to a completed blanket. I finished the border last night, wrapped it up along with some other goodies I picked up for baby boy and gave it to my girlfriend for Mother’s Day. She and her husband were very impressed and I’m eager to see baby boy wrapped up in a blanket knit with so much love for a little person I haven’t even met yet. Another girlfriend of mine asked me yesterday if it was hard to give up the blanket after so much work and the answer was no. 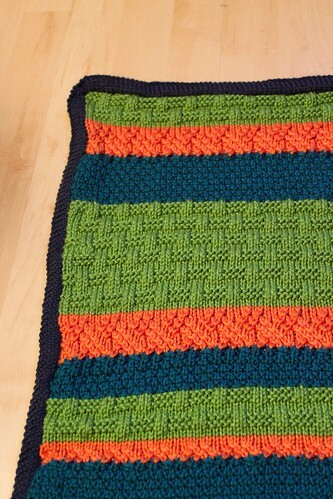 When I knit a blanket for a baby I’m happy knowing it will keep someone warm and cuddly when it’s cold out, it can become their security blanket and that it will always cover them in love. I spend all that time knitting something for someone special, it’s hard not to infuse it with a bit of love and isn’t that the best part of giving a handmade gift? paige loves naps! 🙂 and she IS small! How can we get the pattern for this?